I wasn’t planning on falling in love with the Community Jacket but I tried in on in a size 8 and it fit so nicely on and not as bulky as I expected it to. I also tried it on over the journey jacket and the 8 was still plenty roomy for layering over a sweatshirt. I also love how soft it is and that it’s not the usual crinkly feeling of a rain jacket. I tried on the Alarm and the Coal and I think my favourite was the Lolo and second was the Alarm. I ended up walking away without getting this because I need to really think about it. I’m anticipating more jackets to come so I don’t want to later regret it as I regret not grabbing the Bomber jacket last year. I may pick this up next week if it’s still available or even better yet I’ll pick it up if it ever ends up in markdown later on. Although I don’t feel this is a wait for markdown type of jacket. "Journey Jacket Pictures – Size 8 & 10 Comparison." Thanks for the help. You need all the feedback you can get when you don't live near a store! I do have a bigger chest…I take a 6 in the Track and Field Jacket, is that a good comparison? would the sizing be similar? If you have a bigger chest and broader shoulders you may need to stay TTS but if you don't usually have issues with that than I would try the size down and also try it on with a bulky sweater underneath like I did. 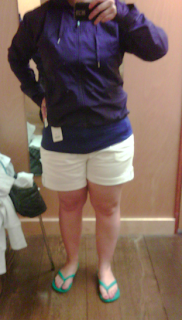 PS, I actually really liked the length of this jacket.